The day my parents arrived in New Zealand was the first time I’d seen sun in weeks. We’d had an unusual series of ongoing storms that had left me feeling a little anxious about what their New Zealand experience would be. Let’s just say I’d been building up with blue water and sunny weather for months. Growing up, most of our family vacations consisted of arriving to a sunny Caribbean all-inclusive resort, relaxing, and maybe doing a day or 2 of diving. This New Zealand experience would be unlike anything we’d done before, and I didn’t quite know what to expect. To my surprise, my parents were up for a bit of adventure from the moment they stepped off the plane at 5:30am. So we piled into our Subaru and headed for the Coromandel Peninsula to the east of Auckland. For nearly two and a half hours, we tooled through the winding steep roads of the misty mountainside. The storms from the day before had left everything so lush and green with steam pouring out of the valleys. It felt like we were in a sub-tropical paradise. Finally, we arrived to Sandy Shores, our vacation house in Whitanga. Perfectly situated across the street from the beach and the ocean, this vacation rental was an excellent and affordable way to experience the area. From our living room, we could see tiny little islands and rock formations peeking their heads up from the ocean. It reminded me of photos I’ve seen or Thailand or Vietnam. I can only imagine how beautiful (and crowded) it must get in the summer when the weather is warm. The stop and start rain showers and cool fall weather wasn’t ideal for laying out, so we sought a bit of warmth at the hot water beach while the sun was still shining. The Hot Water Beach of Coromandel is a truly unique experience. The hot water is created from volcanoes that develop large underground reservoirs. Overtime, water (as hot as 147 degrees F!) escapes to the surface, creating hot springs on the beach, 2 hours either side of low tide. It’s unbelievable the amount of heat the earth can produce! My parents trying to stand the heat on the hot water beach. We arrived not really knowing what to expect. There were 40 or more people with shovels and beers already submerged in the springs, in what looked reminiscent of a hippie commune. So we scoped out a spot to submerge ourselves in the water – not an easy task. To our surprise, the water and sand was excruciatingly hot if you sat to close to the heat source. We had to strategically locate the right area with just the right temperature before we finally settled in. After about an hour, the tides began to rise, sweeping over the sand walls people had built around their pools of water. Before long, the mysterious hot water had disappeared, along with the bathers, and we headed home. 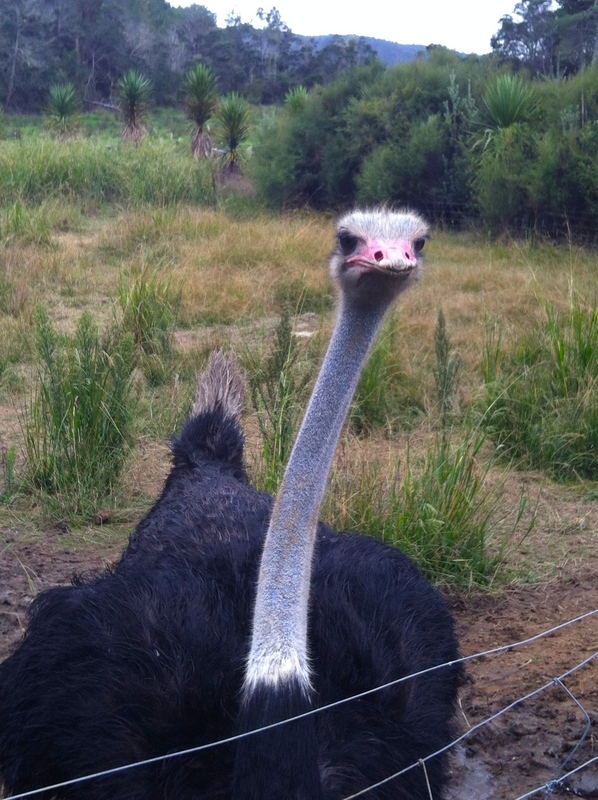 This ostrich was so intense! He got right up in our faces. After passing goats in “goat houses” on the side of the road several times, Joe requested we stop to check it out. I can’t remember the last time I went to a petting zoo, but being in a “sure, why not” mood, we decided to stop for what turned out to be a pretty hilarious and interesting time at Whiti Farm Park. We were given bags full of food and made our way around the farm to feed the animals, which were not your average farm animals. Feeding the feisty animals at Whiti Farm Park in Whitanga, New Zealand. There were ostriches, possums (NZ possums are actually quite cute and sweet, nothing like in US), deer, and wallabies, along with your typical sheep, goats, and donkeys, all eating out of our hands. Is that the dragon dog from The Never Ending Story? 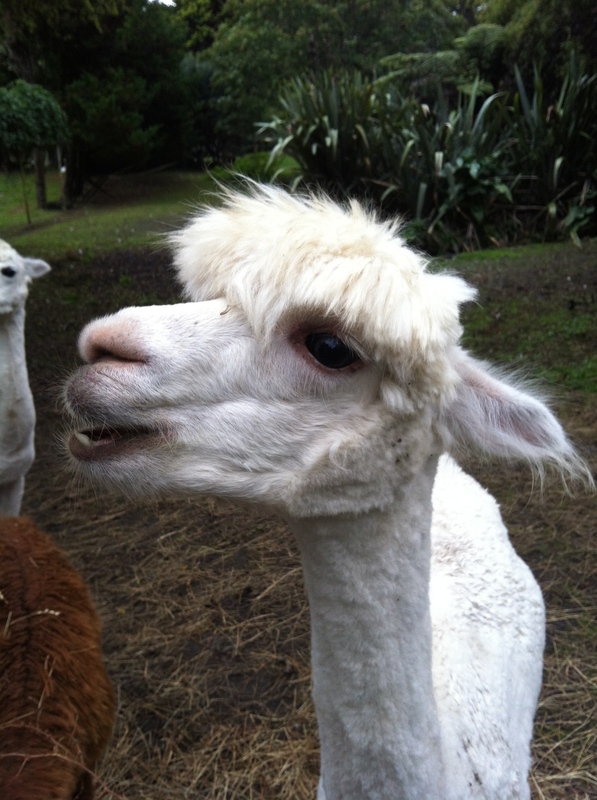 My favorite animal by far, had to be the alpacas. These wide-eyed, furry, long-necked animals were actually quite cute and cartoon-like in person. I think I want a pet alpaca. I mean seriously, how can you resist this baby alpaca fuzzy cuteness? 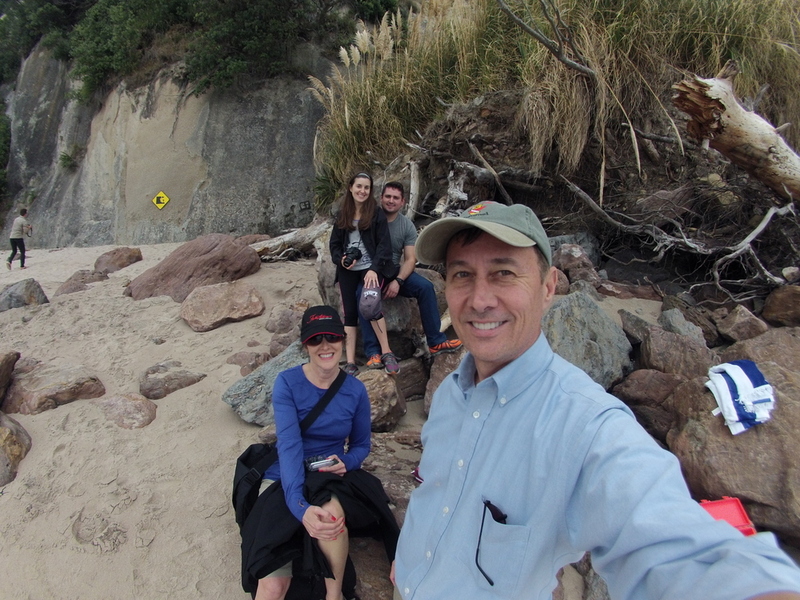 Finally we got back on track and headed to our original destination – Cathedral Cove. My parents admiring the view from our hike. This scenic beach, made famous in The Chronicles of Narnia, is only accessible by foot or boat. We hiked on yet another steep and winding path in the forest for an hour or so and finally emerged on the sandy beaches of Cathedral Cove. It was even more magnificent than I’d imagined. Just to give you an idea of the scale, that's Joe and I standing at the bottom. Despite the fact that I would have gladly welcomed a bit more sun, the water was still a gorgeous blue, and the tunnel and rock formation made for the breathtaking and picturesque scene I was hoping for. This view is an absolute New Zealand must-see. In awe of the massive rock formation just randomly standing in the ocean, I thought about what a truly magical place New Zealand is, still so unspoiled by man. When we just let nature be, such cool things can emerge over time!! We relaxed on the beach for a while, eating trail mix and feeding the birds before the tide began to come in. In just 2 days, I’d already checked 2 items off my New Zealand bucket list, and I felt excited for the adventures ahead.